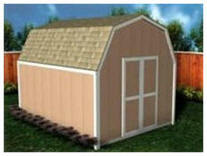 Get started on your new shed or yard barn today. Here's a choice of little tool sheds, huge backyard storage barns, small pole barns, cabanas, pool houses, playhouses, backyard studios, and hobby shops. With one order for just $29.00 you can download building plans for all of the designs that you'll find on this page, and more. 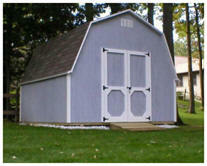 Many of the sheds are designed as do it yourself projects, with material lists and illustrated step-by-step instructions. You can download any and all of the plans right away and print as many copies as you need. 10'x12' and 10'x14' Garden Tool and Lawn Tractor Sheds These attractive sheds are sturdy, permanent stud-frame buildings on concrete slab foundations. They're sure to give you years and years of use. Convenient storage lofts add almost eighty square feet of extra space. You can use the loft space for holiday decorations, seasonal furniture and more. 14'x20' Plans for a Cabana, Shed, Pool House or Backyard Cottage, Office, Shop or Studio This attractive little building would make the perfect pool house or cabana, but you could also use it as a backyard office, studio or guest cottage. The forty-five page plan set that you can download includes framing plans, sections, elevations, a roof rafter isometric, a materials list and all of the details that you'll need. 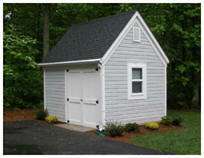 10'x12' Cabana Shed This little building would make a great storage shed. But, it's attractive enough to be your pool house, backyard guest cottage, studio or home office. The thirty-three page plan set that you can download includes framing plans, sections, elevations, roof rafter cutting diagrams and all of the details that you or your contractor will need to build it. 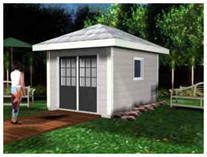 Hip Roof Shed or Cabana This elegant little backyard building will make a great cabana, pool house or garden shed. 12'x20' Gambrel Roof All-Purpose Shed Here's a practical and economical building that you can use as a tool storage shed or as a place to park your lawn tractor. Big doors on both the end and the side give you plenty of options. 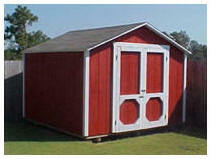 8' Wide Backyard Bonanza Barn-Style Sheds Here are some little barn-style sheds that are perfect for backyard storage. 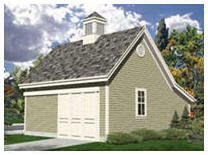 These practical, stud-frame, gambrel roof buildings are designed for easy, quick and inexpensive construction. The drawings include plans, exterior elevations, framing details, material lists and illustrated, step-by-step building instructions. The plan set includes four different sizes: 8'x8', 8'x10', 8'x12' and 8'x16'. 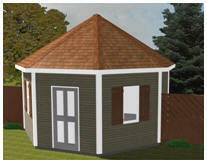 Octagonal Shed Use this unusual all-purpose building as your shed, backyard office, studio, cabana or guest cottage. The construction drawings call for 2x4 walls, 2x6 roof rafters and a monolithic slab foundation. Exterior finishes are up to you, so you can match the appearance of your home. Click on the illustration to see a floor plan. 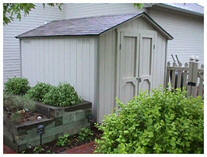 Old West Saloon-Style Shed Are you looking for an unusual backyard building? This design looks like an old-time western storefront, mercantile or saloon. You can use it as your shed, studio, kid's playhouse, cabana, pool house or guest cottage. Hang up a sign and it will make a great home office or shop. The construction drawings call for 2x4 walls, roof trusses and a wood framed floor. Exterior finishes are up to you, so you can match the appearance of your home. Just click on the illustration to see a floor plan. 8'x8' and 10'x16' All Purpose Sheds This practical and pretty little building design would make a great all purpose tool, storage or garden shed in your backyard. 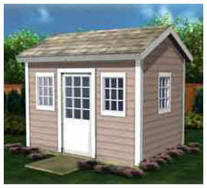 It comes in two sizes, a little 8'x8' tool shed and a big, 10'x16, all-purpose shed, cabana, pool house or backyard studio. 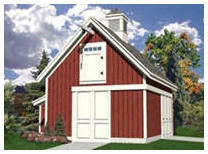 Candlewood Yard Barn Build this little, all-purpose pole-frame building as your shed, garage, tractor shelter, workshop or backyard studio. It has a parking area for a car, small truck or yard tractor, an extra area for a workshop and tools and a convenient storage loft. Candlewood Shed and Shop Build this little, all-purpose pole-frame building as your shed, garage, tractor shelter, workshop or backyard studio. The plans cost $29.00 and are delivered instantly by a link to an easy-to-use web page with construction drawings for all of the sheds and mini-barns shown above and for a variety of other shed, barn, workshop and garage designs. In all, you'll be able to build any of more than one hundred different building designs, layouts and sizes. You'll also be able to download any and all of the plans and print as many copies of each as you'd like. The plan set comes with a complete money-back guarantee.